The Rail Diesel Car (RDC) built by the Budd Company of Philadelphia, Pennsylvania was more evolutionary than revolutionary. 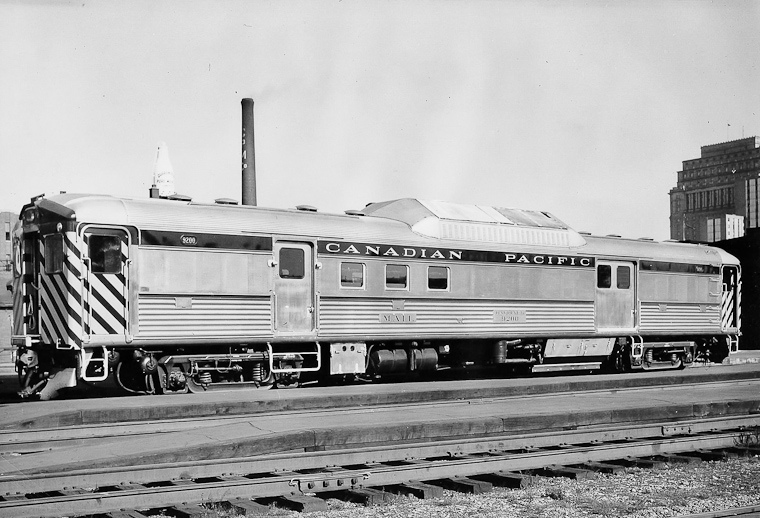 This modern, self-propelled stainless steel car was the end result of half a century of trial and error by many companies that began on the CPR with a single steam powered car converted from a standard wooden coach. Later, a few gas-mechanical and battery-electric cars built new were tried as well. It was not until the 1930's that successful gas-electric cars were built new in larger numbers which continued in service into the 1950's. Budd had a long history of building passenger equipment beginning in the 1930's and its use of shot welding stainless steel perfected this work. 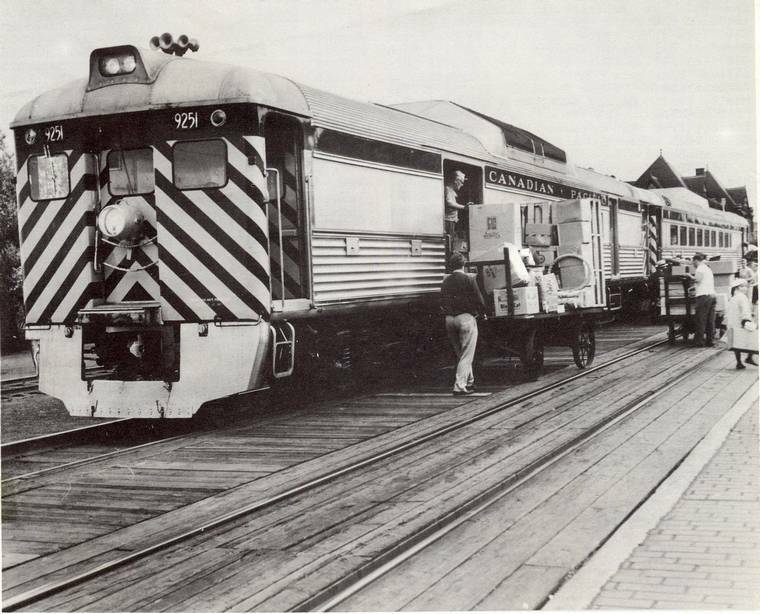 Its biggest single order (173 cars) was for equipping the famous CPR train The Canadian. 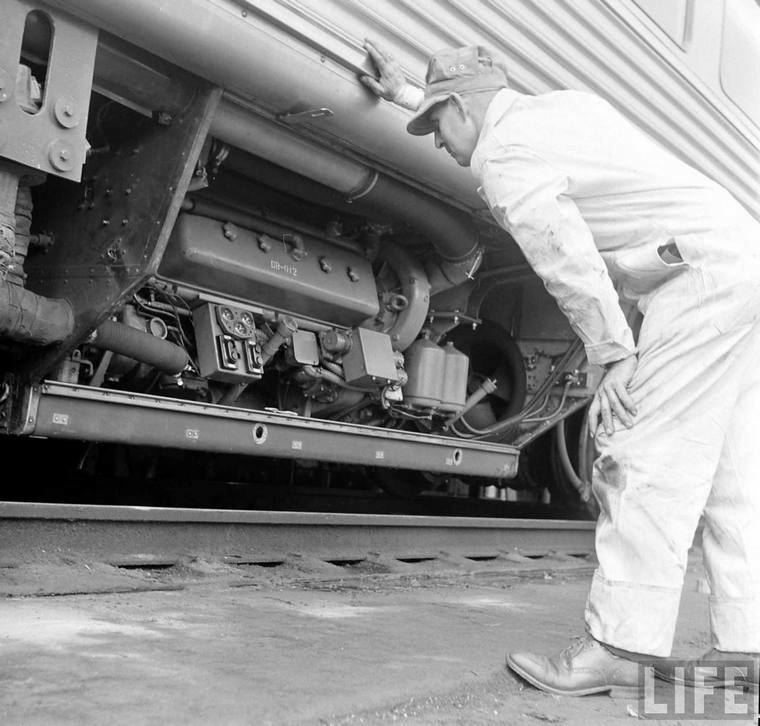 Around this time Budd developed the modern self-propelled RDC with a diesel engine first used for army tanks and a torque converter. 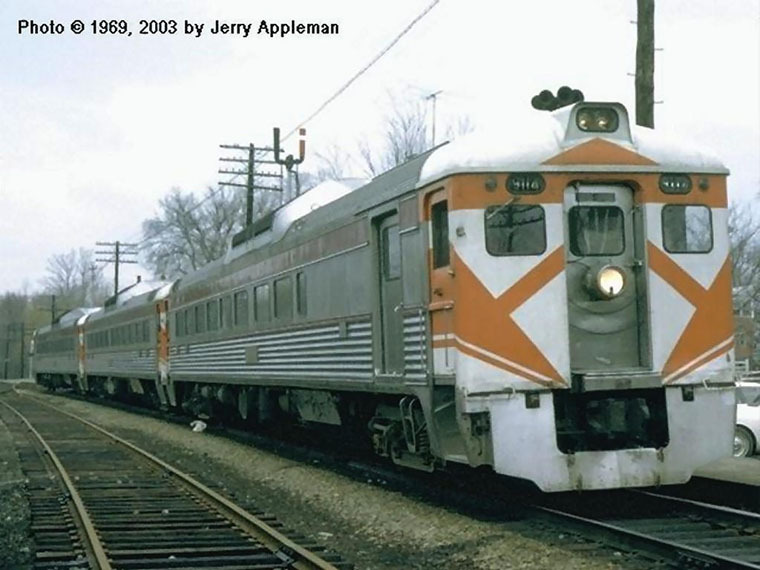 The CPR eventually bought 55 RDC's, the second largest fleet (after Boston & Maine) of these Budd Cars as CPR employees called them. The Passenger Department marketed them as Dayliner. These very successful RDC's saved many passenger trains both on main and branchlines actually increasing ridership for a time. Fast acceleration and deceleration allowed them to reduce schedules considerably including replacing the famous 3000 Jubilee 4-4-4's. Operating costs were reduced considerably over a conventional steam locomotive hauled train with a standard five-man crew replaced by as little as a conductor and engineer on a single car train. A few still remain in use by VIA. It was a six hour run from North Bay, Ont. daily except Sunday effective Mon. 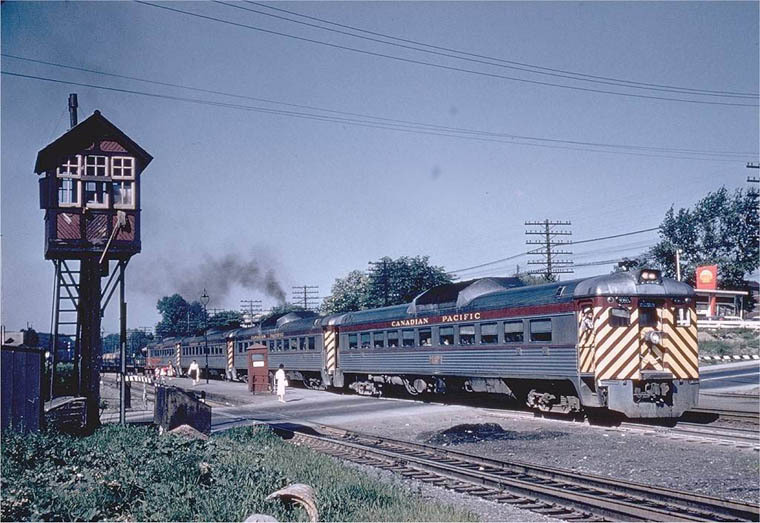 Nov.1,1953 as trains 48-49 and 47-50. 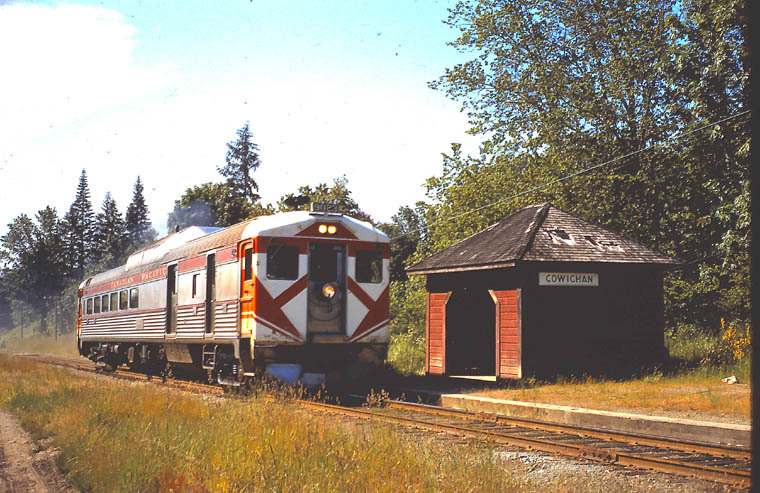 North Bay- Mattawa mainline 45.5 miles, Mattawa-Timiskaming 41.5 miles and Angliers 116.9 miles. 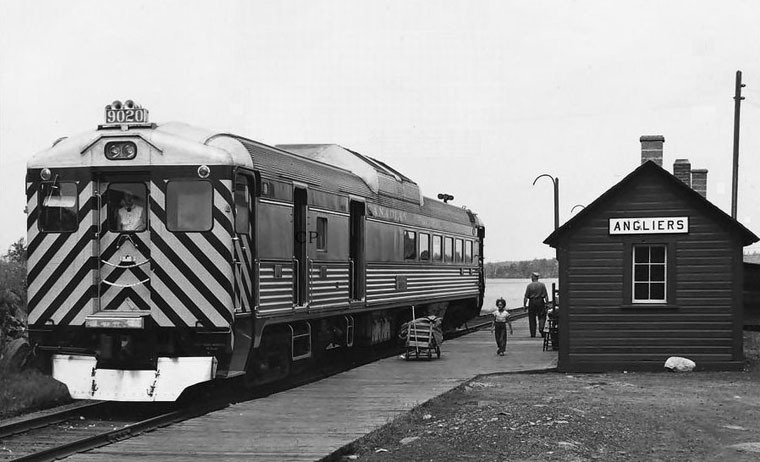 The trains later (4/27/1958) ran from Chalk River (447-449, 448-450) with connections to and from Ottawa. Service was changed and reduced to tri-weekly and finally ended with the new time table effective Sunday, October 30, 1960. 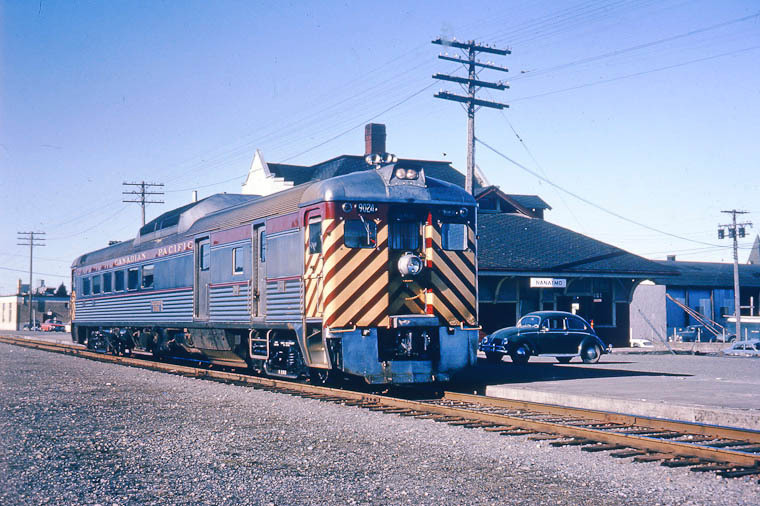 NOTE: This car was the part of the first order in 1953 for RDC's; three RDC-1's (9050-9052) and one RDC-3 (9020). 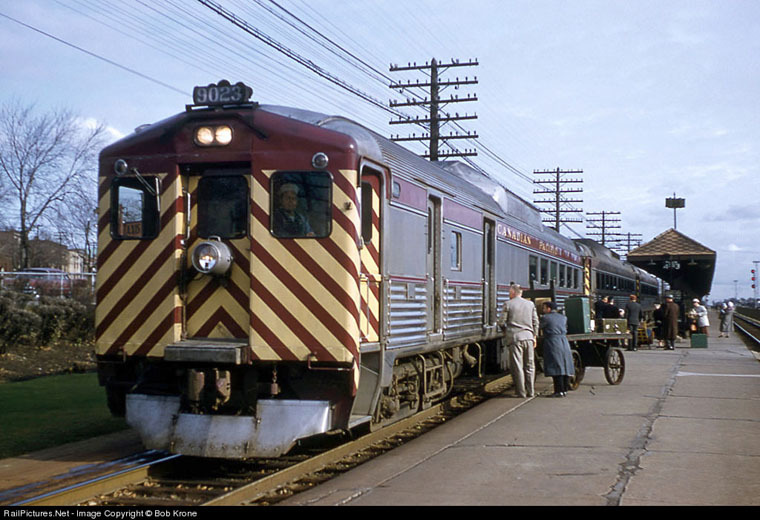 These cars were received October 14, 1953 and put into service 10/19, 10/19, 10/27 and 10/27. 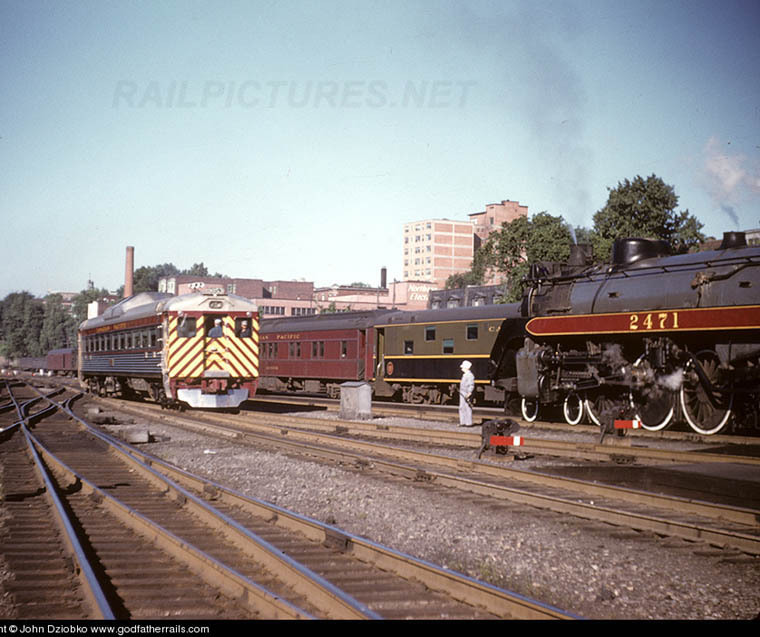 Two RDC's were for Toronto-Windsor-Detroit high speed mainline service while one other was for Montreal-Mont-Laurier. 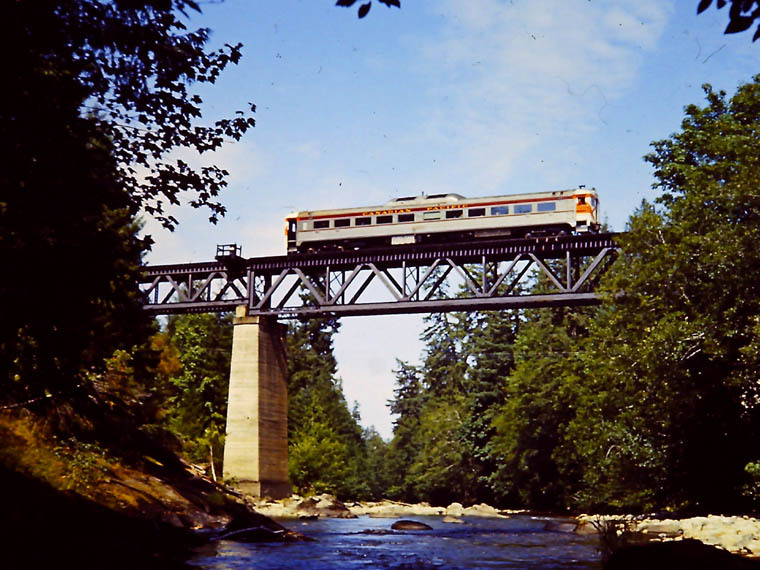 It was this latter run of 163.6 miles that the Budd Co. demonstrator 2960 operated on for three weeks starting Feb.2/1953. 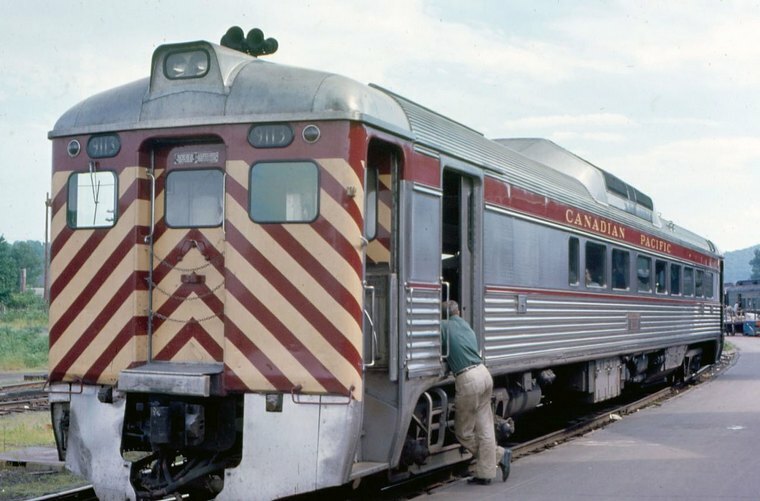 While the standard design of the Budd RDC-3 included an RPO section all CPR cars had none with 30 foot baggage section. RDC-3 9024 provides part of E&N passenger service Daily Exc. Sun. 7:00 a.m. for Mont Laurier. This was the only Dayliner service out of Montreal at this early date. 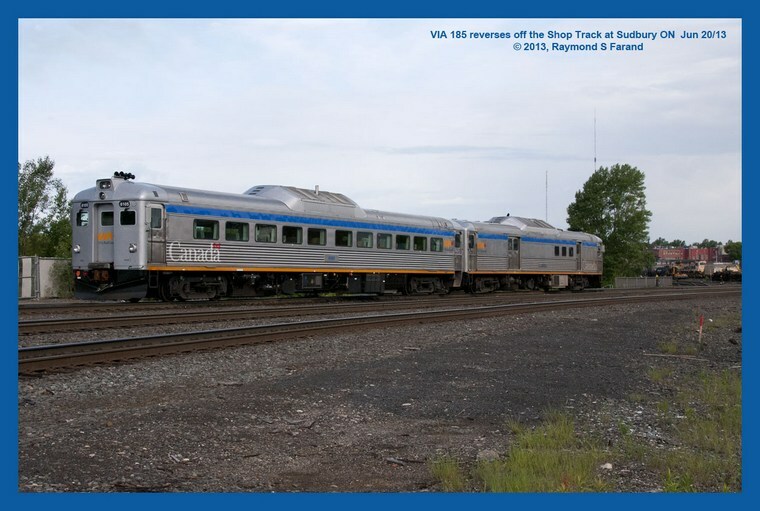 9060 leads three other RDC's more commonly called "Budd Cars" in suburban (commuter) service from Vaudreuil. Note the Shell service station in the background. This modern style structure was a common sight in the 1950's. RDC-4 Length: 73' 10" two 30 foot compartments. 9200 one-of-a-kind on the roster. RDC-4 mail-baggage car. Brand new still without CPR illuminated number board. A two car order for modified RDC-4 with a single 60 foot compartment originally to be 9201 and 9202. 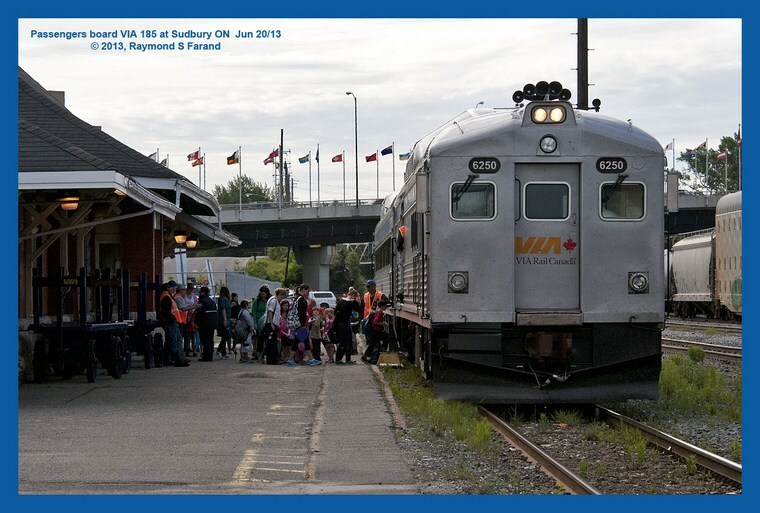 NOTE: Numbers 17 and 18 operated as conventional equipped trains daily between Montreal and Vancouver. at 1.45 pm. No 17 departs Sudbury at 5.00 pm with a next day arrival at Fort William 11.59 am. three days a week. 11.59 am and No 18 Departing Fort William Sun, Tues, Thursday. 9.30 pm with arrival at Sudbury 1.45 pm. 418 operates departing Fort William Sun, Tue, Thur at 6.30 pm arriving Sudbury 1.15 pm next day. Mon, Wed, Fri 11.00 am and departing White River 0900 Tue, Thur and Sat. 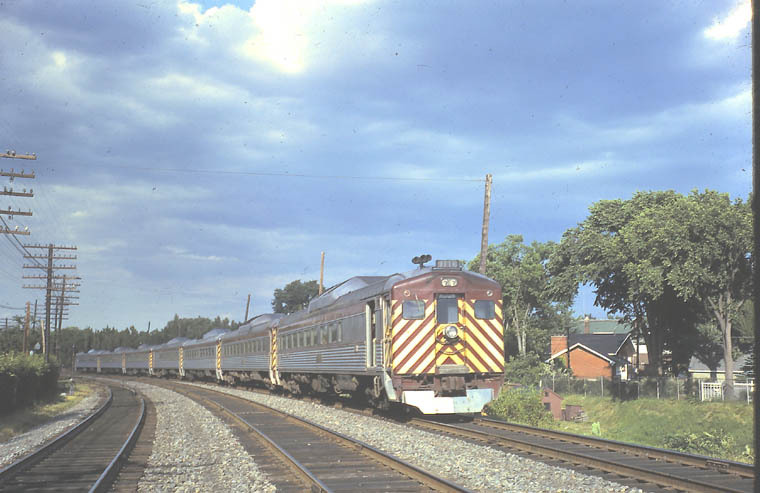 between Sudbury and White River through remote northern Ontario using identical "Budd Cars". VIA 6250 number 185 loading large number of passengers on RDC-1 VIA 6105. Backing off the shop track a little earlier 6250 ex VIA/CN 6450 and 6105 ex VIA/CN 6105 remanufactured IRSI. 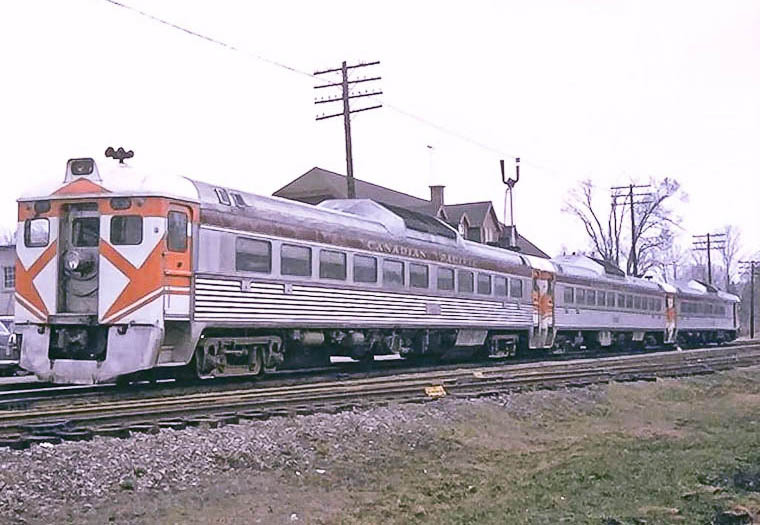 "Hockey Mask" visibility stripes with old CPR Tuscan red side panels. 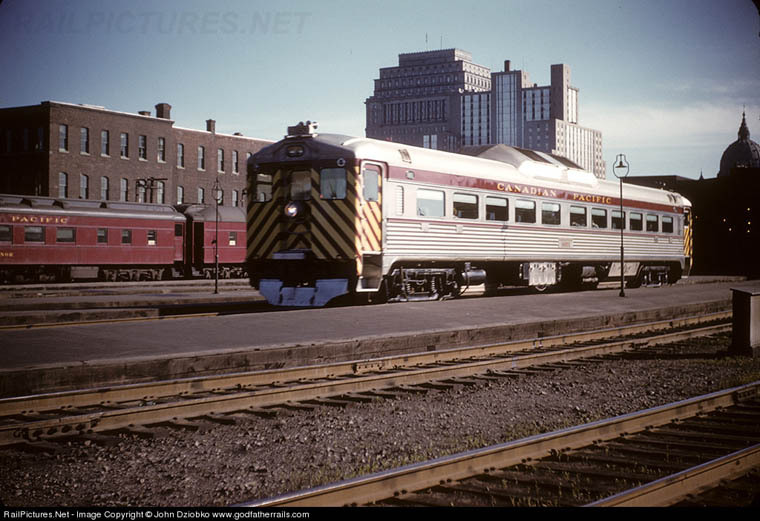 This may well be the turn around point for this commuter train (if #243) from Windsor Station (Montreal) five minutes later becoming Number 254 due out at 12.30 p.m. Other commuter trains on this line ran through to Rigaud. In an effort to improve visibility of approaching Budd Cars which are quite quiet, this dazzle paint scheme was created. responsible for graphics and photography. Railfans have called it "Hockey Mask".